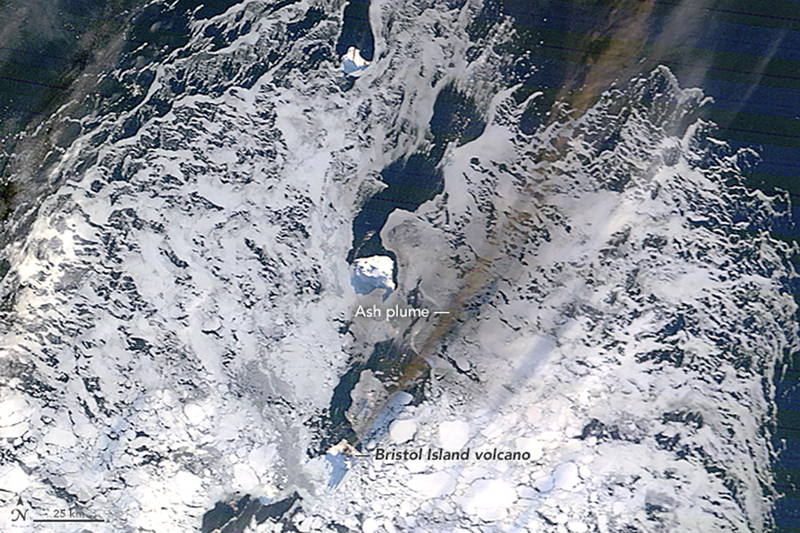 The Buenos Aires VAAC reported that on 19 July a diffuse ash plume from Bristol Island's Mt. Sourabaya was visible in satellite images drifting 30 km NE. A persistent thermal anomaly was also identified in satellite data. Bristol Island, near the southern end of the seven South Sandwich Islands in the isolated Southern Atlantic Ocean, lies 800 km SE of South Georgia Island at latitude 59° S. Historic eruptions occurred on Bristol Island in 1823, the 1930s, and the 1950s. A new eruption was reported from Mount Sourabaya, a cone near the center of the island, beginning at the end of April 2016. It produced ash plumes and strong thermal anomalies most likely generated by lava flows until the end of July 2016. Information about Bristol Island comes from NASA Earth Observatory and other satellite imagery data, and the Buenos Aires Volcanic Ash Advisory Center (VAAC). 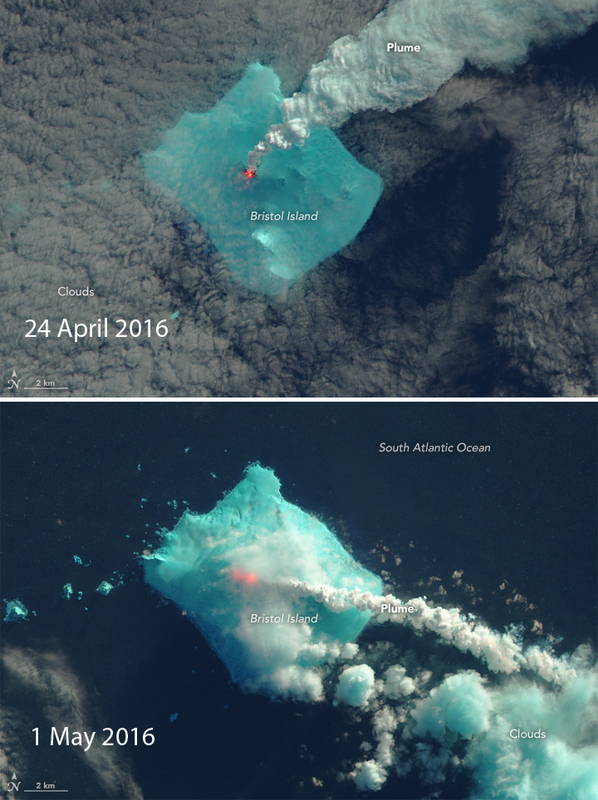 Evidence for a new eruption at Bristol Island first appeared in Landsat 8 imagery on 24 April 2016 as a large steam plume and a thermal anomaly at the summit (figure 1). Another image on 1 May showed the still-active plume and an elongation of the thermal anomaly to the W, suggesting that lava may have breached the crater rim. Two MODVOLC thermal alerts also appeared on 24 April; their frequency and intensity increased significantly in subsequent days. Figure 1. The Operational Land Imager (OLI) on the Landsat 8 satellite acquired these two false-color images on 24 April (upper) and 1 May (lower) 2016 of an eruption at Mount Sourabaya, a stratovolcano on Bristol Island. The images were built from a combination of shortwave-infrared, near-infrared, and red light (Landsat bands 6-5-4) that helps detect the heat signature of an eruption. Both images show what could be lava (red-orange), while white plumes of steam trail away from the crater. In the lower (1 May) image, the thermal anomaly extends farther to the W, suggesting a lava flow. The band combination makes the ice cover of the island appear bright blue-green. Courtesy of NASA Earth Observatory. 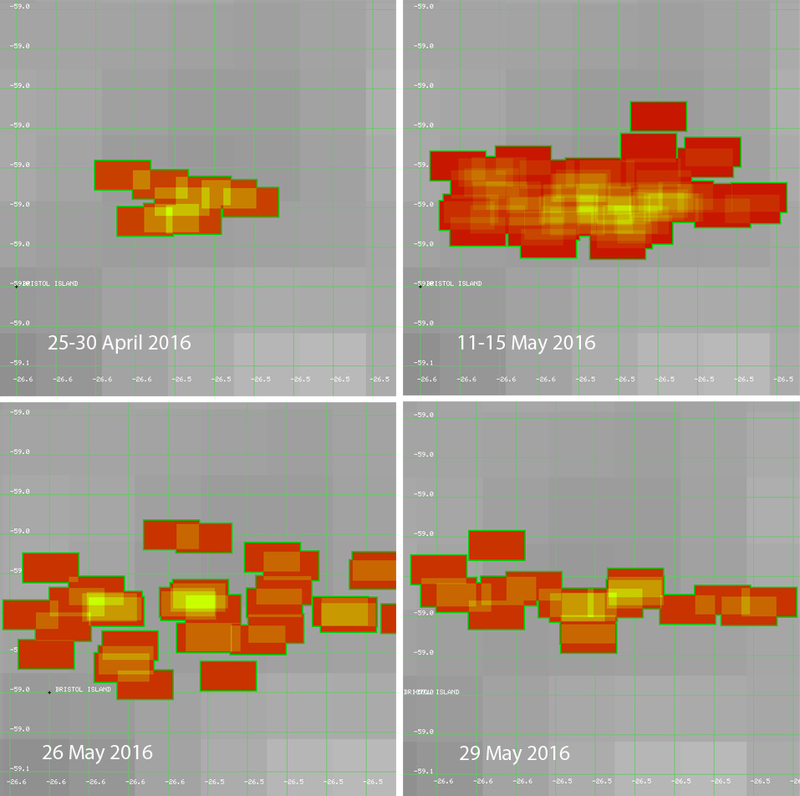 The number of daily MODVOLC thermal alerts increased during May 2016 to as many as 35 on 26 May. On many days, more than 10 thermal alerts were issued. The distribution of the alert pixels suggested that an E-W linear feature such as one or more lava flows was responsible for many of the thermal anomalies (figure 2). Figure 2. MODVOLC thermal alerts for Bristol Island during selected dates in late April and May 2016. Top left: Nine thermal alerts issued during 25-30 April form two linear features trending WNW and WSW. Top right: 59 alerts issued during 11-15 May suggest intensification of heat flow. Lower left: 35 alerts on 26 May are scattered over a wide area. Lower right: 20 alerts issued on 29 May are concentrated in an E-W trending distribution, suggesting one or more flows of some kind as the heat source. Courtesy of HIGP MODVOLC Thermal Alerts System. A Moderate Resolution Imaging Spectroradiometer (MODIS) satellite image of Bristol Island acquired on 28 May 2016 showed an ash plume from Mt. Sourabaya drifting NE (figure 3). The Buenos Aires VAAC issued the first reports of gas and possible ash plumes on 29 May 2016, noting that they drifted as far as 185 km N, NNE, and SE at an altitude of approximately 1.5 km. Figure 3. On 28 May 2016, the Moderate Resolution Imaging Spectroradiometer (MODIS) instrument on NASA's Terra satellite acquired this natural-color image of an ash plume streaming NE from Bristol Island. The plume casts a shadow on the sea ice below. Most of the white in the image is likely ice, rather than clouds. Courtesy of NASA Earth Observatory. The Buenos Aires VAAC issued multiple daily ash advisories during 29 May-7 June 2016. They noted that weather clouds mostly prevented satellite observations of Mount Sourabaya during 1-6 June, though a thermal anomaly was detected during 1-2 and 5-7 June. 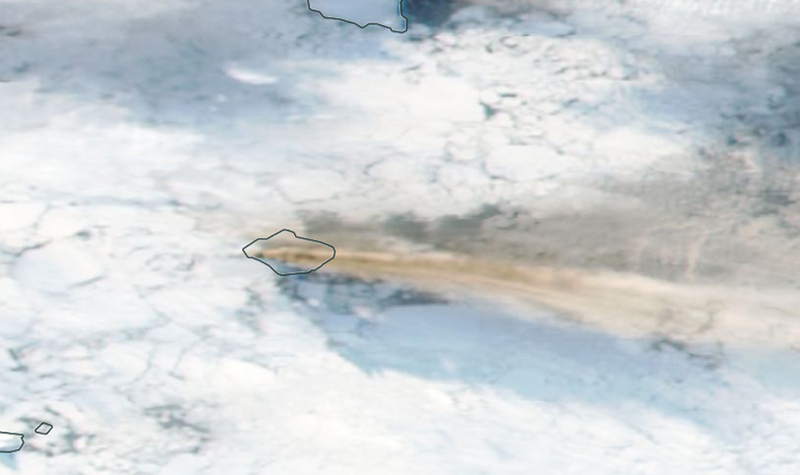 Satellite images from Suomi NPP/VIIRS often showed possible ash plumes mixed with clouds, but revealed distinct plumes on 2 and 4 June (figure 4) drifting E, and on 7 June towards the NE. On 16 June, a diffuse plume of volcanic ash was reported by the Buenos Aires VAAC moving SE at about 1.5 km altitude. MODVOLC thermal alerts continued even more strongly in June than during May. On almost every day, more than ten alerts were recorded, and they continued with a broad E-W distribution similar to that seen during May. Figure 4. An ash plume can be seen drifting E on 4 June 2016 from Bristol Island in this Suomi NPP/VIIRS image (Corrected Reflectance – True Color). Courtesy of NASA Worldview. On 16 and 18 July, ash seen in Suomi NPP/VIIRS imagers appeared to be drifting NE, and on 19 July a faint thin ash plume was identified drifting 100 km NE; the persistent thermal anomaly continued to be visible. No further VAAC reports were issued after 21 July. Numerous MODVOLC thermal alerts continued during most days of July, until they stopped abruptly after the 17 alerts issued on 26 July (figure 5). The MIROVA thermal anomaly system captured a strong signal from Bristol Island between late April and late July 2016 (figure 6). Figure 5. 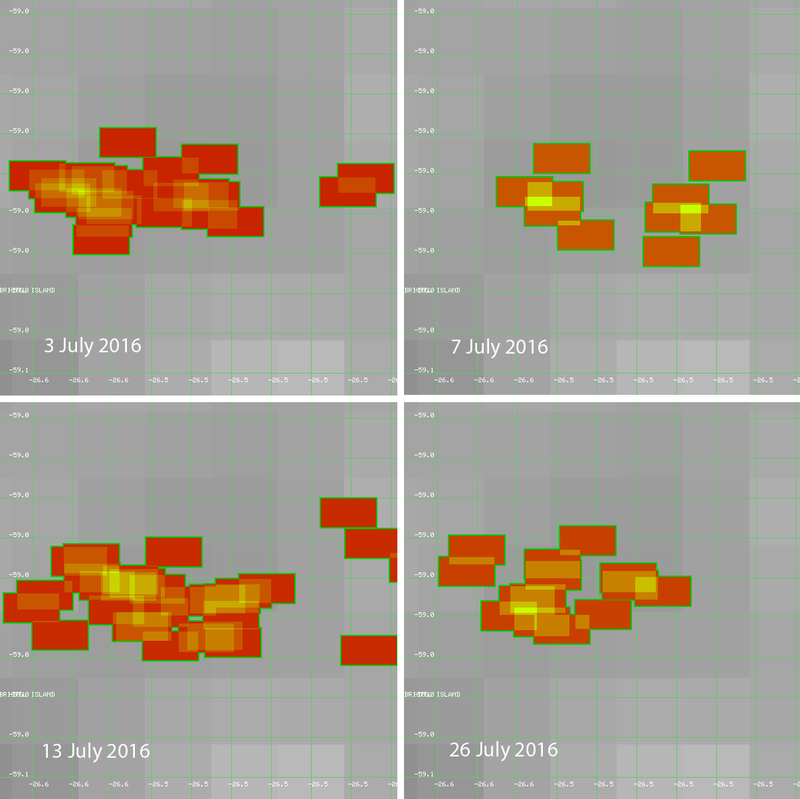 MODVOLC thermal alerts during July 2016 suggest multiple origin points for the substantial thermal anomalies. Top left: the distribution of the 23 alerts issued on 3 July suggests multiple origin points. Top right: two distinct sources are apparent from the 15 alerts issued on 7 July. Lower left: the 30 alerts issued on 13 July are spread over a large E-W area and reflect multiple source points. Lower right: the 17 Alerts on 26 July show NE-SW trending elongate zones of thermal anomalies. Courtesy of HIGP MODVOLC Thermal Alerts System. Figure 6. A strong thermal anomaly signal is apparent at Bristol Island during April-July 2016 in the MIROVA thermal anomaly data. Both blue and black lines signify eruptive activity. Courtesy of MIROVA. Two satellite images, from 21 August and 22 September 2016, confirm the presence of new lava fields around the summit of Mount Sourabaya that were created during the April-July 2016 eruption (figure 7). Figure 7. Satellite imagery of Mount Sourabaya on Bristol Island on 21 August and 22 September 2016 after the eruptive episode of April-July shows evidence of lava flows onto ice and snow surrounding the summit. 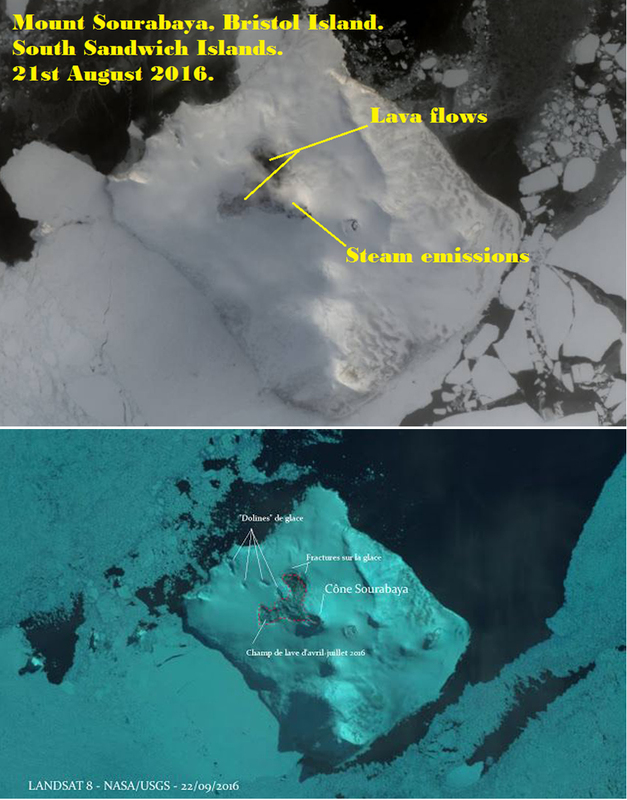 The upper image is from the Landsat Viewer/EOS Data Analytics annotated by the South Sandwich Islands blog; the lower image is a Landsat 8 image annotated by Cultur Volcan. Information Contacts: NASA Earth Observatory, EOS Project Science Office, NASA Goddard Space Flight Center, Goddard, Maryland, USA (URL: http://earthobservatory.nasa.gov/); NASA Worldview (URL: https://worldview.earthdata.nasa.gov/); Buenos Aires Volcanic Ash Advisory Center (VAAC), Servicio Meteorológico Nacional-Fuerza Aérea Argentina, 25 de mayo 658, Buenos Aires, Argentina (URL: http://www.smn.gov.ar/vaac/buenosaires/inicio.php?lang=es); MIROVA (Middle InfraRed Observation of Volcanic Activity), a collaborative project between the Universities of Turin and Florence (Italy) supported by the Centre for Volcanic Risk of the Italian Civil Protection Department (URL: http://www.mirovaweb.it/); Hawai'i Institute of Geophysics and Planetology (HIGP), MODVOLC Thermal Alerts System, School of Ocean and Earth Science and Technology (SOEST), Univ. of Hawai'i, 2525 Correa Road, Honolulu, HI 96822, USA (URL: http://modis.higp.hawaii.edu/); South Sandwich Islands Volcano Monitoring Blog (URL: http://southsandwichmonitoring.blogspot.com/); Cultur Volcan, Journal d'un volcanophile (URL: https://laculturevolcan.blogspot.com/). 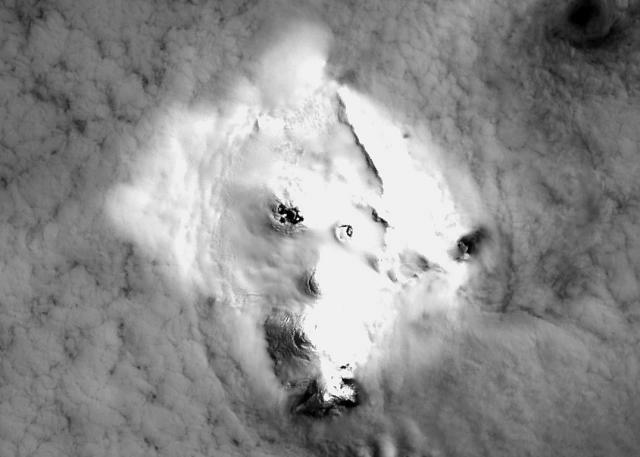 The Buenos Aires VAAC reported that weather clouds mostly prevented satellite observations of Bristol Island's Mt. Sourabaya during 1-6 June, though a thermal anomaly was detected during 1-2 and 5-6 June. The 9 x 10 km Bristol Island near the southern end of the South Sandwich arc lies across Fortser's Passage from the Southern Thule Islands and forms one of the largest islands of the chain. Largely glacier-covered, it contains a horseshoe-shaped ridge at the interior extending northward from the highest peak, 1100-m-high Mount Darnley. A steep-sided flank cone or lava dome, Havfruen Peak, is located on the east side, and a young crater and fissure are on the west flank. Three large sea stacks lying off Turmoil Point at the western tip of the island may be remnants of an older now-eroded volcanic center. Both summit and flank vents have been active during historical time. The latest eruption, during 1956, originated from the west-flank crater, and deposited cinder over the icecap. The extensive icecap and the difficulty of landing make it the least explored of the South Sandwich Islands. There is no Deformation History data available for Bristol Island. There is no Emissions History data available for Bristol Island. The largely glacier-covered, 9 x 10 km Bristol Island is one of the largest of the South Sandwich Islands. Both summit and flank vents on Bristol Island have been active during historical time. The latest eruption, during 1956, originated from the west-flank crater, and deposited cinder over the icecap. The extensive icecap on Bristol Island and the difficulty of landing make it the least explored of the South Sandwich Islands. The Global Volcanism Program has no maps available for Bristol Island. There are no samples for Bristol Island in the Smithsonian's NMNH Department of Mineral Sciences Rock and Ore collection. Large Eruptions of Bristol Island Information about large Quaternary eruptions (VEI >= 4) is cataloged in the Large Magnitude Explosive Volcanic Eruptions (LaMEVE) database of the Volcano Global Risk Identification and Analysis Project (VOGRIPA).